Thank YOU for visiting our site and learning more about Hometown Vending. Our goal is to give you top-of-the-line Vending Service along with an exceptionally wide range of snack choices. You’ll love our modern, reliable vending machines along with 24/7 service that guarantees you never have to go without your favorite snack or beverage. If you need vending service in any of the communities in North Houston, we would be delighted to hear from you. Or, simply ask a question or offer a comment. 1. Is the vending company fully insured? 2. Does the vending company pay sales tax? 3. What is the condition of the vending equipment? 4. How are products selected for the vending machines? How do they know what the customers want? 5. Have criminal background checks been cleared on the route drivers and technicians entering your facility? 6. How often does management check machines to ensure they meet operation and cleanliness standards? 7. How long will a machine be out of service if there is a problem (hours, days, weeks)? 8. Do I have to sign a contract or service agreement? 9. Are the prices your new vending company quoted guaranteed for a period of time or are they teaser rates just to get in the door? 10. How often do the route drivers check for and remove expired products? What is the company’s tolerance level for out-dated products? 11. 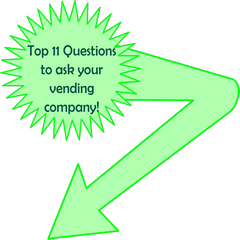 If needed, can your vending company deliver after hours or weekends? Coke Zero Sugar replacing Zero?